Southwest China's Chongqing Municipality launched a new freight train on Tuesday to better serve transportation along the land-sea trade corridor. The train left Guoyuan Port at 10 a.m. and will stop at Qinzhou port in southern Guangxi Zhuang Autonomous Region on Thursday. Cargo such as auto parts and machinery equipment from Chengdu and Chongqing, will eventually be transported by sea to Saigon and Haiphong in Vietnam, and Jakarta, capital of Indonesia. 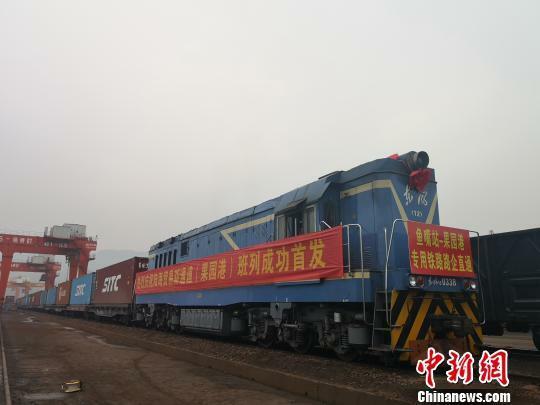 "Rail transport takes about two days from Guoyuan to Qinzhou," said Hu Qiang, vice general manager with the Sinotrans Chongqing Co. Ltd. "The total shipping time to southeast Asian countries will shorten to less than 10 days from 22 days via the Yangtze River waterway." Zhang Guozhi, deputy head of the Liangjiang New Area Management Committee in Chongqing, said that as different international logistics channels interconnect at Guoyuan port, Chongqing has further strengthened its freight capacity and its role as a transport hub. Guoyuan is the largest port on the upper reaches of the Yangtze and a key point connecting the Yangtze River economic belt and Belt and Road regions, with 16 berths currently in use for 5,000-tonne vessels and an annual railway throughput capacity of 5 million tonnes. ​Southwest China's Chongqing Municipality launched a new freight train on Tuesday to better serve transportation along the land-sea trade corridor.